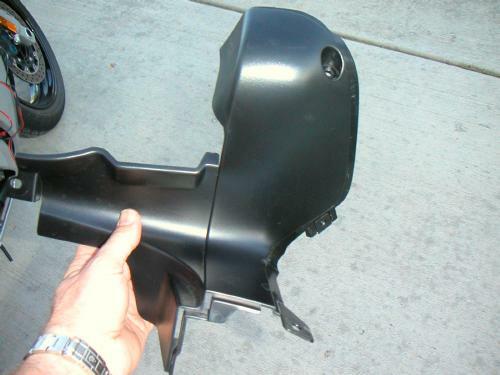 This page shows how to remove and reinstall the 4 black plastic dash panels on the FJR1300. It is useful for planning modifications, or just to see how the panels come off and go back on. 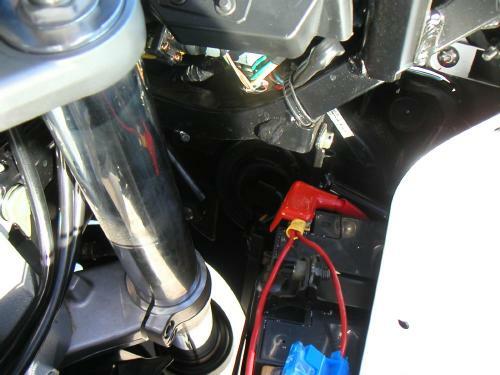 The 4 dash panels are referred to in the FJR1300 Owners Manual and SERVICE MANUAL by letter, from "A" to "D", starting with the left panel which contains the emergency flasher button. The photo above shows the letters in bold yellow on each panel. The order of removal and reinstallation is shown at the end of this page. 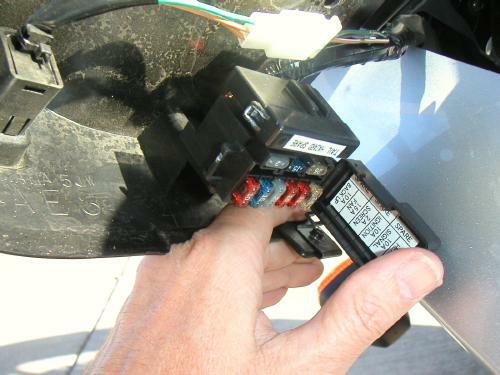 There are two kinds of "quick fastners" used on the panels. This type requires a 1/8th counterclockwise turn with a small phillips screwdriver. That causes the center piece to ride up on 4 little ramps and extend as shown in the photo above. Grip the center piece and pull out a tiny bit, and it releases the connector so the whole thing can be removed. 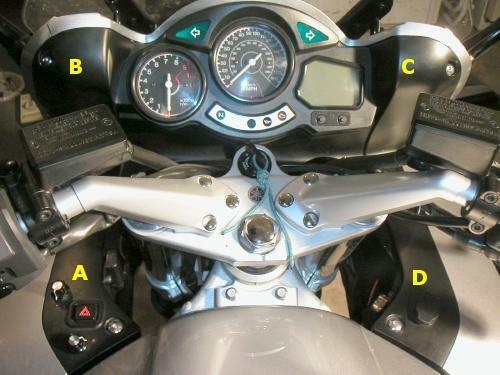 There is one holding panel "C" to panel "B" at the center of the dash, and another one holding panel "A" to the inner fairing piece near the left fork leg. 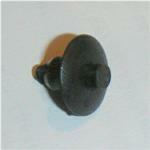 This is the other type of "quick fastener". It has a center pin which is locked when flush with the connector, and unlocked when either pushed in, or pulled out. The photos above show all the positions. These are easy to use, just push the center pin in and pull the entire connector out, then pull the pin out as shown, replace the connector, and push the pin flush. 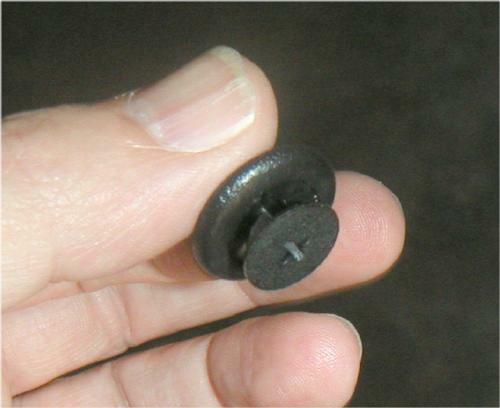 This type is also used on Panel "A" near the other type connector, and again on the two black plastic pieces that attach to the lower rear of the gastank. 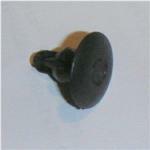 WARNING: The center pin falls out easily, and can be lost in a heartbeat. Be extra careful removing these connectors so you don't lose one like I did (which I found, luckly, lying on top of the rear shock absorber -- but it took awhile to find, even in the well-lighted garage). 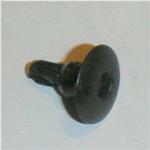 If you lose one of these fasteners, and can't get one from your dealer, try one of the Japanese car dealerships. Mazda, for instance, uses lots of quick fasteners that are similar to the above Yamaha parts, though the some of the Mazda parts are about 1mm larger in diameter and would require you to drill out the holes in the fairing panels. 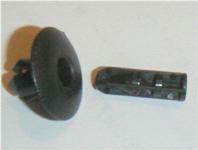 The Mazda P/N for the fastener most like the FJR's is GJ21-68-885B-02. 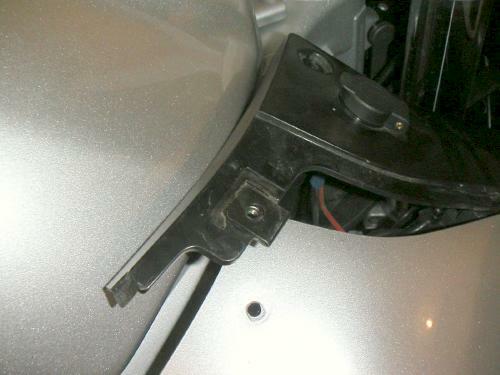 List price is $0.95 each, and the design makes it easier to remove, and less likely to lose the center lock piece than the Yamaha ones. 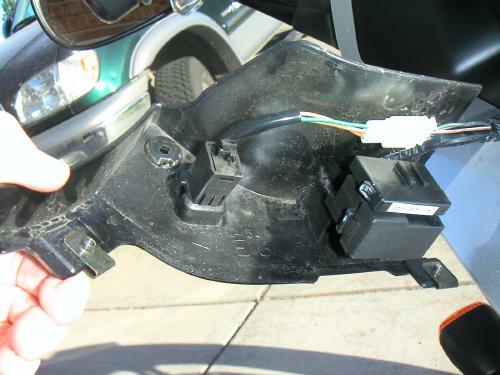 Panel "D" removed (the one under the right handlebar). 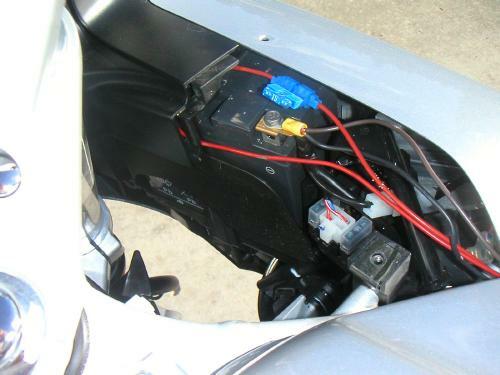 Only the back half of the panel offers mounting points for accessories, due to the close fit of the forward part of the panel over the back half of the battery. The two red and two black wires are part of a harness I added, and are not stock. The blue fuse in one of the red wires barely fits between the top of the battery and panel "D". Panel "C" removed, showing the front half of the battery. 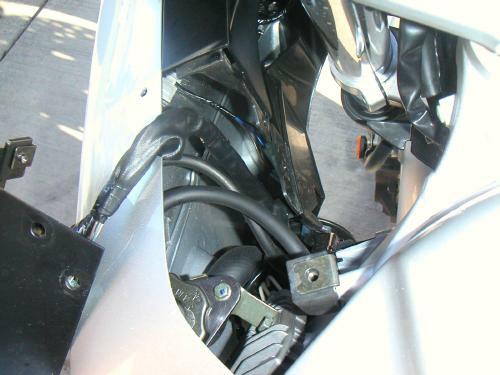 Panel "A" removed (the one under the left handlebar). This is the panel with the emergency flasher button. You can see the large wire bundle running to the fuse block. Underside of panel "A", showing the limited space for mounting connectors like power outlets or HeatTroller control knobs. The fuse block under panel "A". Unfortunately, this location means you have to remove panel "A", possibly in the dark beside the road, to get to the fuses. It requires a 4mm allen wrench and a small phillips screwdriver, and much care to insure you don't drop one of the connectors and lose it (like I almost did taking these photos in my driveway). 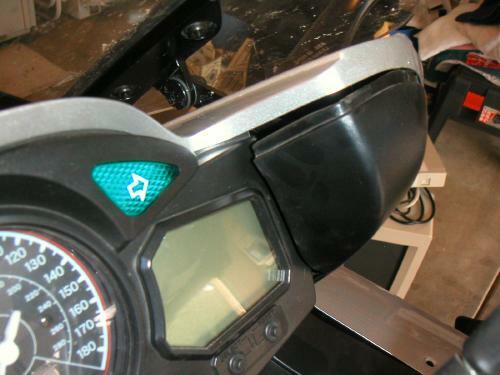 To remove Panel "D", I suggest prying up the edge of the silver fairing and easing the back edge of the panel out first. Be careful of the paint, particularly on the gastank -- it's very soft!